R2-D2 has become the first character officially confirmed for 'Star Wars: Episode VII'. The lovable droid has appeared in all six previous instalments of the science-fiction franchise and now Disney - who bought Lucasfilm and the rights to the series from creator George Lucas in 2012 - have revealed the robot will definitely be part of the new movie. 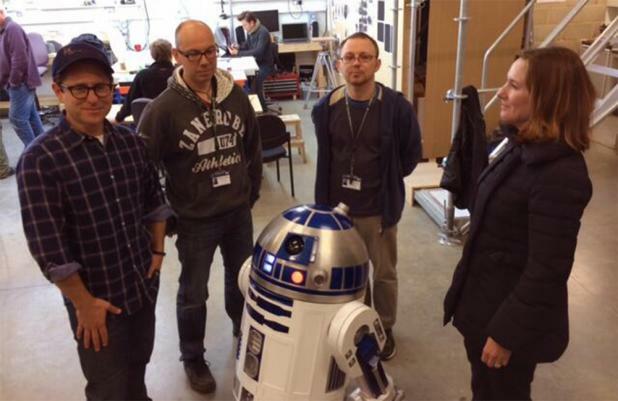 Rumours were rife R2-D2 would be appearing after a behind-the-scenes photo was posted on Twitter last week showing director J.J. Abrams, the blue-and-white astromech droid and two mystery men at Pinewood Studios in Buckinghamshire, England. The men have now been revealed as Lee Towersey and Oliver Steeples, two 'Star Wars' fans who are members of the worldwide R2-D2 Builders Club who build movie-accurate astromech droids from the franchise. They have been hired on the recommendation of Lucasfilm President Kathleen Kennedy to be part of the creature effects team for the movie at Pinewood Studios and they will be responsible for operating R2. Steeples told StarWars.com: "It all started when Kathleen Kennedy toured the R2-D2 Builders area at Celebration Europe this past summer in Germany. She posed for pictures with us, looked at all the droids we'd built and was very complimentary. I mentioned that the R2-D2 Builders in the UK were available if required, as a semi-joke. When I was contacted to work on the film by [executive producer] Jason McGatlin, it was on her recommendation." Both Steeples and Towersey have operated an R2 unit on screen before for a series of commercials for British electrical store Currys and admit there are various challenges to keeping a droid working because of the various gears, lights and electronics that it needs to move. Towersey revealed: "What we do need to do is improve on the mechanics." But the two experts are ready for the challenge and feel honoured to be working on the franchise they have loved for so long. Towersey said: "It's fascinating to see the whole process of filmmaking as 'Star Wars: Episode VII' grows around us. I feel very privileged to be in the working environment I'm in at the moment. It's something I will never take for granted." Steeples added: "It's a dream come true and I hope I can live up to the expectations of the thousands of R2-D2 builders around the world, let alone the millions of 'Star Wars' fans." It is not yet known if actor Kenny Baker - the man who was inside R2-D2 for the previous six films - will take control of the robot again or whether C-3PO, his droid sidekick, will appear. 'Star Wars: Episode VII' will hit cinemas in December 2015.